Unlike messy black lube, it's clean to handle. Out tests show it won't melt out at over 200 degree F., which is hotter than a Texas summer. Seeping lube is a major cause of "slow" handloads or misfires. A popular alloy bullet is the Lyman-Keith No. 454424. Keith's load of 18.5 grains 2400 shoots okay, but I be paper thin cylinder walls make me nervous with move than 17.5 grains. 2400 doesn't burn completely in short barrels. Lyman's handbook lists 7.8 grains Bullseye with this bullet. I found it erratic, and consider it too hot. High pressure was indicated in a new S.A. .45 Colt, which I think is stronger than a conversion. 6.7 grains give 80 fps, which is hot enough. 10.2 grains Unique give 975 fps. Both charges are heavy, and you'll find 5 grains Bullseye, kicked off by CCI primers is the best shooting load. CCI primers are specified because they give perfect ignition for match accuracy. Designed especially for handloading, they have passed drop tests, heat, cold, and every other test I can give primers with flying colors. They help correct variations in primer seating, which is very important. The best commercial cast bullets I've seen are made by Accuracy Bullet Co., 40 Willard St., San Francisco 18, Calif. They supply the Lyman-Keith bullet, perfectly cast, sized, lubed and inspected, at S3.90 per 100, or cheaper in quantity. Their "Copper Coated" type is better for higher velocity, and costs $.90 per 100 extra. This is a copper plating over nickel plating, and can't be scratched with your fingernail like copper washed factory pills. It eliminates leading. The factory uses seven SAECO thermostat controlled furnaces for bullets of uniform weight, density and hardness. An inquiry will bring you their complete list of good cast bullets. Harvey 190 gr. Prot-X-bore pills with 7.2 grs Bullseye or 11.3 grs Unique, at 1,100 to 1,200 fps are as rough on the terminal end as Solomon's mother-in-law problem. Equally good in Colt's or S & W's, they pack the most shock per grain of weight for the velocity. Recoil is mild. I've fired 19 grs 2400, but have not chronographed it. To shoot them the first time, fire a few mild loads in a clean bore to break it in. After that it doesn't require cleaning. To cut clean holes in targets, 4.5 grains Bullseye is as mild as milk spiked with Miltown. To de-lead any barrel, fire a few squib loads with Prot-X-bore bullets reversed in the case. This tip is worth remembering. Any round nose bullet can be reversed in the case and used with moderate charges for close range defense. They cut a full .45 caliber hole, and often tumble. Packed with 40 grains of FFg, the .45 Colt was the Most when it came out in 1873. 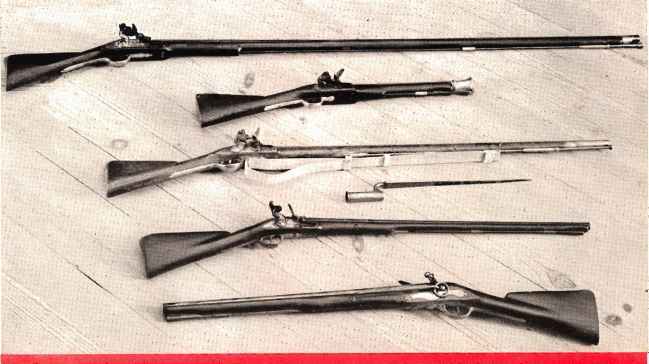 Colt's insured it woidd live for more generations when they revived the best known of all six-guns, the S.A. Army. In the daze of my early teens, shooting from horseback, I rode down and blasted many a jackrabbit and coyote with a pair of these cannons. The pony got in the spirit of things and soon learned to keep the varmints in a good shooting position. If I'm sentimental about the nice handling .45's with six appeal, it's because they served me well and were good bed-roll companions when I slept beneath the stars. You might say the next size KiV comes on wheels. illo 11 gh they are entirely different from those hack home. Out at a hundred meters—that's just about a hundred and ten yards off your muzzle—stands the "Reh." This is the German roe deer, smaller than its American cousin, and far from easy to aim at. ft is a paper target, size 46 by 36.8 inches, with the brownish red deer seen from the left side, the green trees on the target blending in with the oaks along the range backstop. The deer target also has ten "rings" of "which the ten ring is about four inches in diameter; the nine-to-one rings stretching backward and forward of the ten, which covers the area just behind the shoulder. The rings cannot be seen from the firing point, not even with a good target scope. You have to know where the len is, and even to be able to hit it, to avoid losing points. Firing position is standing, but you are permitted to rest your rifle against one of the pillars supporting the firing point roof, just like you might rest it against a tree while hunting. Hitting the head of the animal, the hind part of it, or along the "edges" gives you a clean miss in points. The shooting program calls for five shots, and fifty points is often scored. At the same distance is an ugly little black fellow, little only because he is so far away. Facing him at point blank you would find him big enough. He's the "Keiler," the wild boar, 28 by 39.4 inches in size, nearly black. With his front legs hidden in the grass, this game target certainly does not tell very much about where the ten ring is located, and they expect you to fire five shots offhand. .. Easier to see is the jolly "Fuchs," the sitting fox, displaying himself atop a tree stump. He's got ten rings, too, and is in full fox color. Like the other targets, the animal is life-size, and looks very realistic in the natural colored surroundings. Firing is five shots. Positions permitted are prone, kneeling or sitting. The ten ring is four inches in diameter. Again, there is a wild boar, but this is the hardest of them all. The distance is reduced to 60 meters, which is about 66 yards, but the "boar" is running, placed on a little carriage which slips across the six meters of visible area in a flash. Pushed by a man behind the bullet-proof wall on each side, the carriage runs on rails, and pretty fast, too. Six meters is a trifle less than twenty feet, so you have to be fast on the trigger. The man at the "arriving end" which is the left side of the run. has reason to be very happy that his wall is bullet-proof when new shooters start this incredibly difficult, but also incredibly interesting firing. The program calls for five shots, target is ten-ringed, and position is. of course, offhand. Having finished the "Reh," the "Keiler" and the "Fuchs"—there is just one left of the standard series of targets, the poacher. The "Wilddieb," or game thief, is regarded as a major criminal in Germany, and he should not be surprised to be shot off like a varmint. German hunters usually include the poacher target in their training, and also here you may score fifty points in five shots— unless you put a bullet through the poacher's hat, which has a big "0" on it.